Socks are required. We suggest athletic pants with a t-shirt or tank top. No shoes are permitted in the studio. To ensure client safety, there will be no admittance to class ten minutes after class has started. As a courtesy to others, please do not leave the studio during final stretch. Please also make sure that all cell phone ringers are turned off. Go Figure is a first generation barre studio that provides boutique instruction in The Figure Method®. The Figure Method barre class incorporates the best of Pilates, Yoga, orthopedic exercises and classical ballet technique. It is incredibly effective in toning, strengthening and conditioning. In less than 10 sessions, our clients improve posture and flexibility, sculpt and tone the entire body for a noticeable, dramatic result. 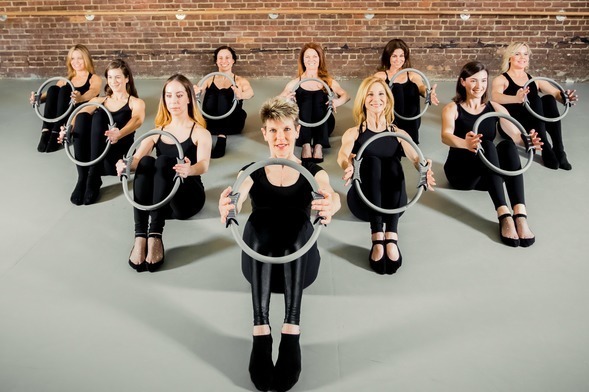 Go Figure is home to instructors who are experts in barre-based fitness; many have been teaching Figure Method for more than 10 years. We are a very experienced team dedicated to innovating choreography while also emphasizing proper alignment and form. We pride ourselves on continuing education and hands on corrections; striving to raise the barre in the field by regularly attending alignment workshops and choreography meetings. Under new ownership, Go Figure is expanding its schedule and offerings with exciting developments underway. Come see what’s new!